Android smartphones focusing on improved displays and cameras haven't beaten the iPhone but are narrowing the gap, suggests analysts from Cowen, with main rivals Huawei and Samsung said to be considerably outspending Apple on the rear camera assembly in each of their flagship mobile devices. A preliminary analysis of the bill of materials (BOM) for the Samsung Galaxy S10+ and the Huawei P30 Pro reveals the two companies are getting quite close to Apple in terms of their margins, a Cowen investor note obtained by AppleInsider advises. While the iPhone has been estimated to cost low to mid-60 percent margins for the last couple of generations, the Galaxy S10+ is thought to have margins of 57 percent to 60 percent, while the P30 Pro is estimated to be between 63 percent and 65 percent. "We estimate that Apple and its peers have been able to maintain or expand hardware margins in recent years even with escalating BOM costs in certain subsystems," according to Cowen. 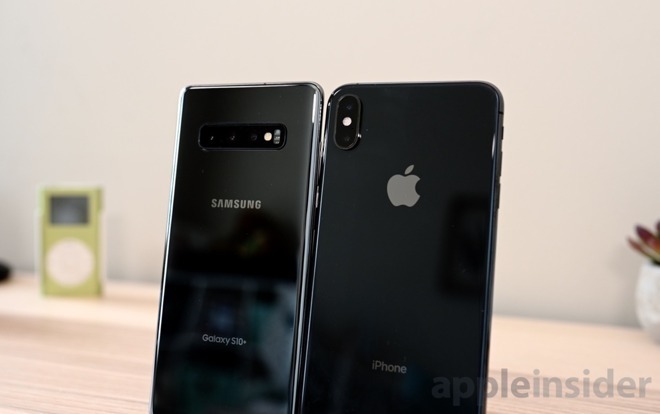 The biggest and most obvious escalation in spending is on the cameras, with the S10+ having two front and three rear cameras, the P30 Pro having one at the front and four at the back, and the iPhone XS and XS Max using TrueDepth at the front and two at the rear. Samsung's cameras are estimated to cost $44 per device, while the higher resolution and Time-of-Flight camera used in the P30 Pro pushes the cost up to $56, whereas the iPhone is thought to have a camera system that costs $34.50 per device, representing 8 percent of the BOM. Just on rear cameras alone, Samsung and Huawei are forecast to have respectively spent 1.4 times and 1.9 times as much as Apple. The price difference may simply be down to the use of more cameras on the Samsung and Huawei devices. Apple is rumored to be adding a square camera bump and a triple-lens configuration on its 2019 iPhones, which could provide a third zoom option alongside the established wide-angle and telephoto cameras, or even to enable depth mapping. Though iPhone remains competitive in camera quality, "Apple's greater integration of software to complement the hardware sensors is an element that cannot be fully captured in a BOM analysis," admits Cowen. "We also note that Google's Pixel smartphone family which has highly regarded image capture abilities still makes do with a single rear main camera with software helping it maintain an edge in image quality." In comparing the displays, and assuming Samsung is the supplier for all models, the iPhone's screen is estimated to cost $120, while the higher pixel density Galaxy S10+ is worth $125, and the lower resolution and color gamut P30 Pro is $110. Representing between 20 and 25 percent of the BOM, Cowen concludes the screens of all three "are all of leading edge quality with subtle differences noticeable in a side-by-side comparison." Though less of a competitive area, the processing capabilities of each are also thought to be worth monitoring, with the A12 Bionic using a hexa-core design while the Samsung and Huawei versions are octa-core based and have integrated LTE modems. "We believe the addition and innovation of AI accelerator cores or 'neural engines' as part of the GPU core design is of a greater focus," the note reads. Cowen warns that the 4G design expertise of Huawei "and even Samsung" have garnered over the last few years could help the two companies put Apple at a near-term disadvantage for 2019 with the introduction of 5G cellular services. Apple is not anticipated to bring out a 5G-capable iPhone in 2019, which may give its rivals a significant advantage in terms of connectivity. It is unclear if Apple will maintain its overall lead long term, as Cowen suggests "With peers focusing on superior display and camera quality, we believe it is too early to tell if catering to social media power users will lead to further iPhone sales declines." While Cowen's BOM breakdown shows that there is comparative levels of cost between the three models, it is worth remembering that both the Samsung Galaxy S10+ and the Huawei P30 Pro are relatively new devices, whereas the iPhone XS was launched in September last year. Both Samsung and Huawei had the opportunity to learn what they needed to change in their flagship models to keep them competitive with the latest iPhones before launching them.